Every month I write a detailed report sharing exactly how much I’ve earned online and where it comes from. Although the numbers are there for you to see, what’s more important are the lessons learned to make those numbers happen. Every month I try new things and sometimes they work – and sometimes they don’t – but I’m always happy to share my results with you here so you can learn from them. My first monthly income report from October of 2008 totaled $7,906.55, which is a lot for the first month – but what most people forget is that leading up to that month, I had put in a year and a half of hard work into my first online business (GreenExamAcademy.com) before I ever tried to monetize it. That time was spent struggling through the technology, creating content, building connections and most importantly, establishing myself as a trusted authority in the niche I was serving, and still serve to this day. The purpose of these reports are to inspire you to take action, give you an update on what’s going on in my businesses, and of course show you what works and what doesn’t. During the first week of November, I had the pleasure of presenting a keynote presentation at an event in Arizona called PartnerCon. PartnerCon is hosted by InfusionSoft for their top partners and ICCs (InfusionSoft Certified Consultants), so it was really interesting to get an invite to speak for a company whose software I had never used before – although I’ve heard many things about it. InfusionSoft, for those of you who don’t know, is a powerful sales and marketing software that a lot of people in the online space use to do several things, including manage contacts, sell products, automate email marketing campaigns, track everything, and even run their affiliate program. It’s like an email service provider, shopping cart, CRM, tracking tool and an affiliate program all wrapped into one. A lot of people swear by InfusionSoft, so I was really interested in spending time at PartnerCon to get to know the product more and the people behind it as well. I still have a lot to learn about the software and may give it a test run before making any serious conclusions about it, but I can say that the people behind the software are great and they’re doing what they do for the right reasons – to help make life easier for the small business owner. Plus, they were all incredibly friendly and easy to get along with, and I could tell they really enjoy what they do, which is important. I was very impressed! As far as my keynote presentation, the challenge leading up to the event was understanding exactly who the audience was and what they were there for. It forced me to dig deep into their existing speaker line-up, their event page from last year and have multiple conversations with the event coordinators, but it was totally worth the extra effort. The big lesson here is that no matter what you’re doing, you have to understand who your audience is in order to best provide for them and make the greatest impact. This is obvious when it comes to public speaking, but what a lot of people forget is that this is especially true when you’re doing guest posts for other blogs or you’re featured in an interview on another podcast. What was interesting is that the topic that seemed perfect for this audience, based on my expertise and what I could provide for them, was one that I had already presented about before. Up until this event, every single time I’ve been asked to speak, I’ve created a brand new presentation. My talk was about How to Use Free in Your Business to Get More Traffic, Subscribers and Customers – the same topic I did at NMX earlier this year, but it was awesome because I knew which parts from NMX worked the best and what else I could do to improve the talk. After rehearsing for a few weeks, I was sure this time it was going to be even better than the first time – and it was! Not only was I much more comfortable on stage, but after the event, I was told that it was one of the highest rated presentation during the entire conference! Their AV company is working on editing the videos from the event, and I was told I was going to get a copy of my presentation once it’s ready. I’ll be sure to upload it to YouTube for you, and you’ll be able to see what I did differently this time around. Another lesson I learned was just how much easier it was to present something the second time around. During my prep work, I re-watched my presentation from NMX and took notes to help me figure out what worked and what didn’t, and it helped like mad! If you’re ever going to do anything again, you have to do two things: 1) Commit that you want to improve, and 2) Go back and critique yourself so you know what you can do to improve. This goes for public speaking, recording podcasts and videos, and even writing blog posts too. When was the last time you re-read something you wrote, or watched a video or listened to a podcast you recorded a while ago? Smart Passive Income Gets a Face-Lift! 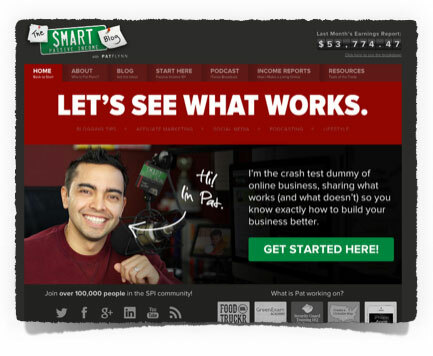 After months of talk and teasing, the Smart Passive Income Blog finally upgraded its look! I’ll be writing an extremely detailed post about the updated design very soon, sharing thoughts and data about why things are the way they are, but the reason I’m waiting is because the site is still undergoing some tests and changes based on user feedback and heatmap tracking. One interesting thing I wanted to share with you is how much my podcast download numbers were affected by the redesign. With the previous design, I was getting about 12,000 to 15,000 downloads per day. When the redesign came out, my download numbers dropped to 6,000 to 7,000 downloads per day – an absolutely significant decrease! This was crazy to me! After some discussion with several members of the SPI audience, it became very apparent that it wasn’t as easy to get to my podcast episodes anymore. In my attempt to clean up the site and make it less overwhelming, I took out an important navigational item above the fold that I thought was accounted for elsewhere on the homepage. After a quick discussion with my developer, we put back our old menu at the top of all of the pages, which includes a link to the podcast section, and boom – my podcast numbers went back up. Not only did they go back up, but they’re even higher than they were before. Today, I’m averaging 18,000 to 20,000 downloads per day, and just last week I broke 30,000 downloads in a single day for the first time ever. Never assume. 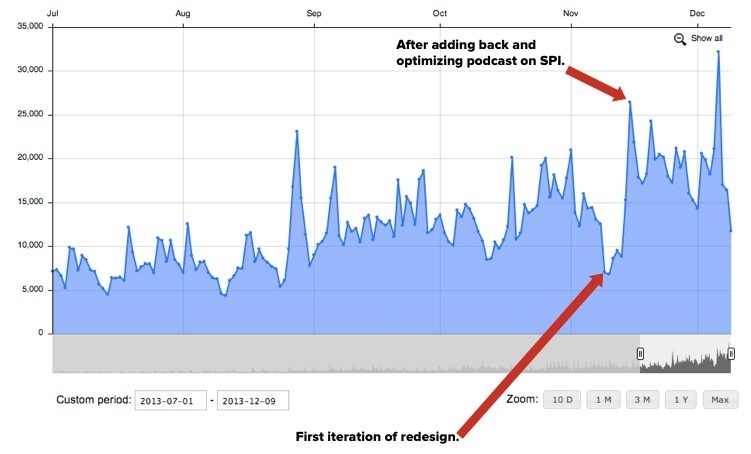 When my podcast downloads were cut by 50% after the redesign, it became apparent that not everyone was listening to the podcast on their mobile devices. A major chunk of them were listening online directly on the website! After I found this out, I went back to each and every one of my podcast episodes and made sure all of the players worked (some didn’t) and that any links that were in the show notes would open a new tab or window – not in the same window. If it opens in the same window, then people listening online would have their audio stopped, and there’s a big potential for them not to come back. If you have a podcast of your own and have show notes with links, make sure your links open up in a new window. I have a lot more to share when it comes to the new redesign, but overall I’m extremely happy with the results! Bounce rate is lower, time on the site is higher – but I have to give it some more time before I know for sure what the results are because I know a lot of people like to explore the new site and spend more time on the site and visit more pages just because it’s new. Oh, and yes – 18k to 20k downloads per day on the podcast. That’s more than there are unique visitors to my site each day. If that doesn’t interest you in starting a podcast, I don’t know what will. Check out my free podcasting tutorial, used by hundreds of people to get their show listed in iTunes. It includes everything from what equipment to use to how to record a great show up and running sooner than later. 100% free, no opt-ins or emails required. FoodTruckr.com, the latest project I’m working on for Niche Site Duel 2.0, is in content creation mode, and things are moving along quite nicely. This is simply a result of giving Google what they want: highly relevant, unique content. Of course, it helps that a lot of what’s being written isn’t talked about anywhere else on the web – at least not in this much detail – which is partly the reason why I chose this niche in the first place. Rankings move up and down daily, and to be honest I’m not really worried about it right now. Too many people worry too much about where they rank too early in the life of a site, and it drives people crazy! It used to drive me crazy too, to a point where my mood would change depending on where I would rank that day. All of that movement just means Google is trying to figure out where your site belongs. You’re on their radar, so instead of worrying about rankings, keep worrying about providing excellent content so you can show them where you deserve to end up. Right now, traffic is still minimal and the new podcast I recently launched for the site (it’s up to episode 3) is getting about 50 downloads per day, but I haven’t listed it in iTunes yet. 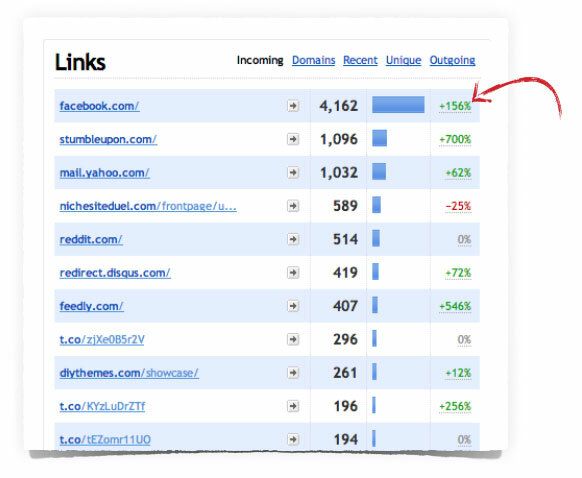 That’s the next big step for the site and it should gain some more traction there. Beyond the podcasting strategy, another idea I’m trying out is to help facilitate and create the industry’s first Industry Report. I figure, if I can get a good number of food truck owners to participate in a survey, some really interesting data could come from it that would be extremely useful to food truck owners and other companies associated with the food truck industry. At the same time, it would help establish FoodTruckr as an authority in the industry, and could be a yearly report that could get even more food truck owners on board with the brand. So far, I’ve reached out to several food truck owners who said that they would be interested not only in participating in the survey, but in the data that comes from the survey as well. It’ll be a great way to provide a snapshot for the industry that could also make some headlines on a national level too. Other businesses have been running per usual, with very minimal work done in November. The iPhone app business is running smoothly. Between all of our paid and free apps, we’re seeing about 4,500 downloads per month. The 80/20 rule continues to apply with 80% of our revenue coming from 20% of our apps. My business partner and I for this side venture keep meaning to experiment with new app developments, but we’re both so involved with other projects it’s hard for us to find time to get together to plan more apps. We have been talking more recently though and may look toward building more niched applications in 2014. I’ll keep you posted if there are any new developments in the app arena. GreenExamAcademy.com is experiencing a small surge due to the fact that the current version of the exam will be expiring soon. This is good because that usually means there will be an influx of sales, but that also means when the new exam comes out, new exam material will have to be created. It would take a month of work to create new exam material based on my previous experience, so in early to mid-2014, I’ll have some decisions to make. Ok, let’s get to the numbers for November. 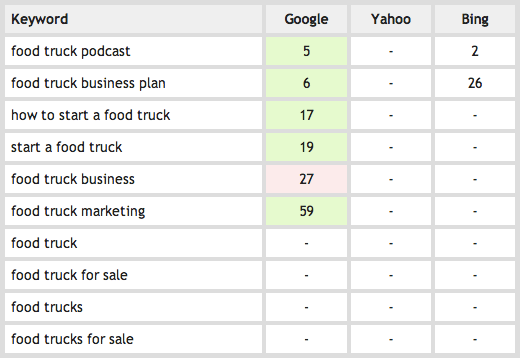 My goal with the new businesses that I’m creating, including FoodTruckr.com, is to increase the non-SPI income side of my income report. Yes, $10k is a significant amount to be earning outside of the site already, but the SPI portion has grown so big, I feel like that income from here has overshadowed what I’ve been able to do accomplish outside of SPI – but I still feel it’s important to be transparent and share how much I’m earning here with you. At the end of November, I published a podcast interview with Gary Vaynerchuk that made me realize how much more I had to learn about properly using social media. To put it another way, I realized how lazy I was and how a few minutes of extra time to actually think about what I was doing on platforms like Facebook and Twitter could help get my content in front of a lot of other people. We spend so much time creating content but very little time promoting it, and we think that we have this social media thing down by simply creating social media accounts, having conversations with a few people and even gathering a sizable following, only to just simply share links when new content is available. After reading Gary’s new book Jab, Jab, Jab, Right Hook 4 times now over the past 2 weeks, I can see that properly using social media is an art, and I still have so much to figure out. I’ve been applying some of what I’ve been learning on Facebook recently, and I have seen results because of it. Before, when I used to post on Facebook, I’d get 1 to 2 shares per post. Now, I’m getting 10-30, which is huge! Plus, more comments and engagement, and it makes complete sense because pictures are what people see first in their news feed. It sounds so simple, but most of us don’t take the extra time. What were your big take aways from last month? Was there anything new you learned that you would like to share with the SPI audience? Please leave a comment below. Thanks for taking the time to read this report, I appreciate you! Cheers!